I might be wrong but is the TD SL combo pictured the one I have now? How much clean up did you do to the faceplate before casting the few that were done? ..... All the others are raw casts... Which I must dig out and paint up one day..... I just don't have the space at the mo..... Even my 20th tour helmet is in a box! Cheers, Mark, thanks for your post. So that photo of the TD/SL combo was the master SL dome with my own personal copy of the TD mask. I went back and checked and yes that's the one you got, but not the same dome. Each mask was slightly different in terms of cleanup because that was based on the type of finishing work that was done (I was testing different options at the time)...so part of it was just from the finishing but in another instance it was actual cleanup. The one pictured that I had (and you got) was raw and not cleaned up. Yes you are the only person (if I recall correctly?) to have ever gotten a TD/SL mask/dome combo. so, any closer to the source Thomas? Heh, delayed reply but, nope. Basically if I see some new kind of photographic or physical reference (ie: new mask) come up, I compare it against the TD to try to find out more about the lineage and about the original ANH mask. But such reference is hard to come by so it isn't very often I get something that I can use for further research. I would be so interested to know more. .........one day maybe. Well, we have a few facts to consider. June 24. 1977 the Vader helmet was seen in its screen used state during the tours when Kermit Eller visited Jefferson Starship and was photographed by Corbis. Sometime between that time and August 3. 1977 the helmet was molded - the mold we know as the UK mold. The TD helmet originates from that mold lineage, so cannot have been made during ANH production so has no links what-so-ever to whatever repairs were done to the screen used helmets tusk tubes. Like, at all. The next confirmed appearance is August 3. 1977 and shows the helmet in its repainted state and it is this look we see in the Rick Baker mold casts. So both molds were made approximately around the same time - between June 24 and August 3. 1977 - as Rick Baker confirms he molded the helmet at the time he fixed it up. The reason that this can be narrowed down like this is the filler in the grills that is seen in the UK mold casts is nowhere to be seen on the actual helmet until after June 24. Those are facts that cannot be disputed. Anyone can check the picture evidence and verify this for themselves. So, within the timespan of one and a half months, both the "UK mold" and the US Rick Baker mold was made. Which begs to reason that both molds were done in the US, but still leaves the question: who made the "UK mold"? Firstly, there is already evidence of paintwork in the Jefferson Starship images, if you look closely. So much for that theory. If there was paintwork already done to the mask at the Jefferson shoot, then the rest of your time line needs to be looked at. I would consider the probability, and that your theory requires, that the original ANH helmet was molded twice in the span of only 1.5 months in two different countries? Secondly, what exactly do "we see" in the Rick Baker mold casts in terms of evidence of a repaint? Can you point that out to me please? Because they don't. And what Rick Baker mold casts are you talking about exactly? There is the DJ ANH but that was sanded down and painted. There's the SL ANH which I've gone through in detail to show it has the original paint detail from the Tantive IV close-ups. And? The efxANH? We have no close-up reference of the master casting and it is from the same mold as the SL ANH but like decades later. 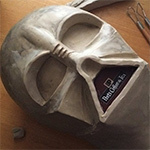 The fact is that we see the current original ANH mask with a complete repaint. Complete. I've checked all the surfaces and every single one is altered in some way. The SL ANH mask has the Tantive IV paint, not a repaint. The TD ANH I cannot tell because it is painted itself with many layers (not multiple times because the layers are identical in width), but it has the major paint details under that (like the “rabbit ears” on the right cheek). So what exact "fix up" did Rick do to the original ANH mask? All that was done was adding a bit of filler material to the tusk tube undercuts, and it looks to me as far as I can tell, although I could be wrong, that the original ANH mask still has the filler on the lower tusk tube undercut (doesn’t seem like it is on the upper tubes). The TD ANH and the other masks from the UK mold do not have that filled undercut on the lower tusk tubes, as you well know. So it would seem the UK mold could have been made before the Baker mold. The Baker mold has the gaps between the teeth filled in more than on the UK mold castings so we don't know whether the "filler triangle" was there already or not. Could the UK mold have come after Jefferson Starship photo shoot? Yes. Could the TD ANH have come after that? Yes. Since the filler triangle is there today, that would seem reasonable. But there are still many things that beg the question about why it has TD ANH mask has the things done to it that it has. There is more I need to do to compare the Girod mask to the TD ANH, let alone the SL ANH, but certainly options are open at this point as to time line. But there are still some things about the TD ANH that pre-date the SL ANH, but we know that the Rick Baker mold masks do not appear later as far as serving the ESB lineage....the UK masks do that. The tube ends do change during production of ANH, that I'm sure of but the fact the TD ANH tube ends are cut back are only probably coincidental rather than related to that, as you suggest. Anything I study about a mask is to attempt to put it into some kind of time frame, just as we are attempting to do now. As new material appears, such as this original screen mask, there will certainly be revisions to some ideas. Yes. Kermit Eller has confirmed he touched up the helmet. But at that date it is still closer to the screen used look than after the repaint before the footprint ceremony. The fact that the face mask does NOT have the filler bits stuck in the grills at the Jefferson Starship photoshoot at June 24. 1977 proves the mask wasn't molded prior to that, but after, and since the UK casts have more details preserved than is seen in the repaint, then it again proves that it was molded before August 3. 1977. The pictures and evidence in the casts and on the original helmet as it looks now regarding the filler in the grills proves it was molded sometime between those two dates. Since the helmet was in the US at that time, that means the UK mold was made in the US. Question is: by who and when? Rick Baker stated he molded the helmet when he fixed it up and repainted it. So that leaves a second molding pretty close to the first one. Unless what has now been dubbed the Rick Baker mold that was used for tour helmets, really isn't his work at all. Don Post has claimed to mold the helmet and do tour suits - was that confirmed or was that a lie? If Rick Baker actually molded the helmet prior to reworking and repainting it, then that would make it the UK mold, and then the one in the Archives is the Don Post tour mold. Though, if Rick Baker molded the helmet AFTER he fixed it, then there is still the question of who made the one we know as UK mold? That one is still an open question - who made it and where and when - while Rick Baker is confirmed to have molded it, and Don Post claims they did too which to this date is unconfirmed. What I've seen regarding the SL has been sharpened pictures to show details. You've confirmed doing that at several occasions with your comps to really show the similarity, but that also makes details sharper than they really are. Having seen several casts from the Rick Baker mold now, it is clear that all details are muted and soft and major ones missing or faint - details that are also missing or faint on the repainted helmet. There are a lot of details from its screen used state that is still visible in the cast on the original - it isn't removed by the repaint. The SL casts you've sold also show details as muted compared to what you show off in the comparisons. There's no way the SL can be a cast of the pre-repainted helmet. It is just physically impossible. If I enhance contrast in an image, it is just to show the details which are already there. In hard studio lighting, they can show up when light reflects acutely off a surface. I'm just replicating that in my home studio. Simple. I could easily photograph the SL ANH master casting in flat lighting and make it look like a copy. Likewise I could photograph a copy to make it look like the master. It doesn't matter what the copies of the SL ANH show. When I show images of detail, it is from the master. And when those details match exactly to the Tantive IV details, it shows the Rick Baker mold was taken off the original mask before the repaint. You know on Vader's left cheek front face, the ring detail with the single point in the center? Top center of the cheek? It's a black marking on the original mask on the Tantive IV screen captures, clear as day. And clear as day in my original photograph of the original ANH helmet when seen at high resolution. Yes, the ebay photo that I bought. That 8x10 photo has unprecedented resolution of details like that. That ring is GONE in the Jefferson Starship images. Completely GONE. The Rick Baker mold of the mask was taken before that time. Even on the neck you can see in the Jefferson Starship images the black circular marking I call the "tristar" on Vader's left side of his neck (front left) is gone in the Jefferson Starship images. But there on the Tantive IV. And there on the SL ANH. The neck repaint on the Jefferson Starship images is clearly obvious as all the wear damage is covered on the neck by that time. Same holds true for Vader's left cheek. Trying to create an argument from what you've seen from SL ANH copies isn't really valid when I'm able to show original paint detail at unprecedented resolutions when I first posted them. When I get home I'll try to post them again. I've posted like how many comparisons of detail on the SL ANH that matches the paint on the Tantive IV mask? And you still think the SL ANH represents a repainted mask? So yes, the photos I show have some sharpening done to show the details. TO SHOW THE DETAILS THAT ARE THERE. There's no magic here, waving a wand. The details are there and faithful to the original. There are so many parts of the mask I never even go into yet that I could show more detail. But I'm back and stand by all the comparisons I've done in the past and can go through them again. Speaking of Jefferson Starship.... the screenused ANH appears in the Star Wars Holiday Special. I strongly encourage repeatedly watch it until you have found no reason to watch any more Star Wars. Thomas, you speak like someone who hasn't worked on or painted one of these types of helmets. When TM owners paint their helmets do you automatically assume that they are going to cover all those details? No!? It doesn't: instead it is akin to the original being repainted. It soften details depending on how thick they apply the layer of paint or how many layers they apply, but even though it's a visually covering layer, it doesn't have to be a physical covering layer. Anyone who's painted a TM can attest to that. The details are still there, only slightly muted. The SL cannot be a cast off the screen used ANH prior to repaint due to the things that are missing. And what it has showing is muted. And missing detail where there should be detail is the key factor here - not details that are there. And there are many. We know the TM has been sanded and reworked, so that can explain many of the things missing - we simply do not know if they were in the raw cast to begin with, we can only determine what is there now. The SL is a raw cast out of the mold, so should have ALL details from that mold, right. Does it have all the details of the screen used prior to repaint? No, it doesn't! Does it have the details seen on the repainted helmet? It sure does, because the same bits missing on the SL are also missing on the repainted original. Then why is it so hard to believe it's a cast off that repainted helmet, when things match more with that one than how the screen used looked before the repaint? And I haven't just seen SL copies, but untouched casts from the US mold too. It just does not make sense to me that you can claim it's exact to the screen used prior to repainting. The whole when "blank" was molded is a hard question to answer based only on pics, but I will say this the casts from the RB mold have more significant details in certain areas that are muted on the TM. For example, the drips near the chin vent are way more detailed on RB mold casts than the TM and we know the TM isn't sanded there, that falls in favor of the RB being done before the repaint. Also the drip that goes down the neck is not only more visible on the RB mold cast than the TM, but it's way more raised, like a bump-which you can actually feel if you go over it with your finger. On the TM it's visible, but flat and I don't believe it was sanded down, that also falls in favor of the RB being done prior to repaint. There are details all around the RB mold faceplates that are identical, if not more detailed than on the TM. The TM is missing the paint drips along the rear of the mask, but that is because of sanding on the TM itself since the UK mold casts have that feature as well (as far as the first mold anyway). The black paint detail/paint flake on the inner nose of vader (right side as you look at it on the inner portion of the nose), which is seen in the Tantive shots, is visible as a detail on the RB mold casts and not visible on UK molds as far as I can tell, again in favor of the RB before the repaint. The damage to the nose outline, is very visible on the RB mold casts and also on the UK mold casts, so that doesn't say much. That damage is visible on screen, but due to the bright light hitting the nose and mouth outline in the corbis pics, it's hard to tell if it's visible on there. Along the neck, the hash marks (the ones I believe were caused by the wedding ring) are much better detailed on the TM than the RB mold casts. Also, the paint/damage details on vader's right cheek on the RB mold casts are practically identical as seen on screen. So basically, there are pros and cons to each in favor of molding prior to repaint. I personally cannot say for certain one way or the other which came first. My gut feeling is the RB mold came first and it came prior to the repaint, but that's just my opinion. Also, I think what we believe to be the original ANH in some of these photo shoots, could probably be RB mold casts done up and their paint job is making us believe they are a repaint of the original. It's just that some pics in these promo shots do not at all scream original ANH to me. * EDIT: A fellow TM owner asked me to look at the TM nose area again regarding the black paint detail/flake. After looking at it again, it is in fact on the TM nose also, so the UK mold would have that detail as well. From one of the fans watching in the stands, this has been really informative. Thanks! And sharpness and softness of details can also be caused by the silicone and the resin used. The two TM's I had had different levels of sharpness to the details yet where molded off the exact same helmet, so the fact that it is sharper on one cast and softer on another has multiple explanations. Also, the SL is a 1st generation straight out of the mold, whereas the TM is argued to be at least a second generation or more removed from the original UK mold, which can account for the muting of some details as well, but it still has detail where the SL doesn't - or have it as clearly. From what I can tell, the SL does not have the same level of brush strokes on the mouth side walls, or the inside side walls. We know the TM has been sanded in various locations - but that's why we keep referencing with other UK mold casts, where some have the details and others don't. If the SL doesn't have those, but for instance the ESB stunt does... and the repainted helmet doesn't... how in the world can it be argued that the RB mold came prior to the repaint and the UK mold after? It makes no sense to me. It's illogical. Or... am I to understand that you guys are hinting at that the details on the TM are fabricated? I'm trying to confirm a detail from the pre-repaint helmet that is seen on the ESB stunt helmet, but not seen on either the TM or SL or for that matter the repainted original and will post on that later.